Moreno Valley USD superintendent, Dr. Martinrex Kedziora, first introduced FEV’s Online Tutoring in the 2016-2017 Academic Year across the district’s middle schools. The district decided to start tutoring at the middle school level because there was a big dip in proficiency for students entering the 6th grade. Catching skill gaps in middle school would help prevent students from falling further behind and stay on track to graduate high school with college and career readiness skills. FEV Tutor worked with stakeholders at each middle school to create a customized tutoring program. Tutoring was delivered either during the school day or in an after-school setting, depending on the needs of the school. 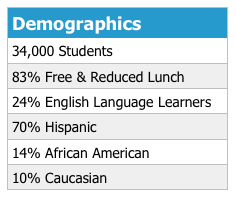 MVUSD shared students’ Fall NWEA MAP Growth scores so that the FEV data team could analyze and identify students that would benefit most from live, 1:1 tutoring and to create Personalized Tutoring Plans for individual students. Tutoring Plans were based on RIT Scores, focus areas, and projected growth goals. Approximately 900 MVUSD students met weekly with tutors to work towards mastery on their own set of learning objectives. Tutoring began in September 2016 and concluded in July 2017. Students worked 1:1 with tutors to bridge skill-gaps through personalized instruction that aligned to MVUSD curriculum with the goal of improving SBAC/CAASPP scores and attaining individual NWEA MAP Growth goals. “When we introduced FEV’s tutoring we saw that students wanted to be there, they wanted to come back... Sometimes the mathematics was very challenging for the student, but they were comforted and supported by the tutor. They became more confident in their abilities because they trusted and found something in their FEV tutors that they weren’t getting with our other tutoring programs." FEV Tutor worked with the MVUSD Assessment Director to complete a Fall-to-Spring NWEA MAP Growth analysis and CAASPP analysis to measure student growth. In Academic Year 2016-2017, MVUSD set a district-wide goal for 50% of all students to meet or exceed their Fall to Spring MAP growth goals. 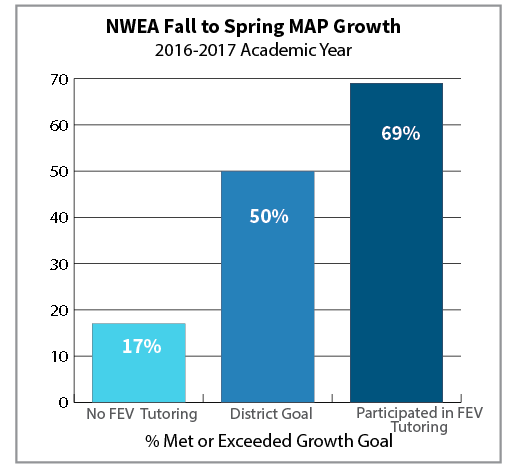 We are pleased to share that 69% of FEV Tutor participants met or exceeded their Fall to Spring MAP Growth goals in Math compared to 17% of students who were identified for tutoring but did not participate. 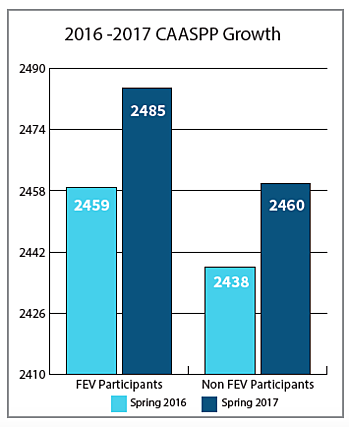 Students that participated in FEV tutoring grew by an average of +26 scale score points from the Spring 2016 CAASPP to the Spring 2017 CAASPP, compared to +22 points for non-FEV Tutor participants. We found that students who participated in ten or more tutoring sessions had the highest rate of performance level movement. For students that took 10 or more sessions, the percentage of students who scored a Level 3 (Standard Met) or Level 4 (Standard Exceeded) grew by 15 percentage points from the Spring 2016 to Spring 2017 CAASPP. The percentage of students who scored a Level 2 (Standard Nearly Met) grew by 13 percentage points. This 13% increase is significant because most students who participated in the FEV tutoring program scored a Level 1 (Standard Not Met) on the 2016 CAASPP. Interested in Offering Virtual Tutoring at your School?